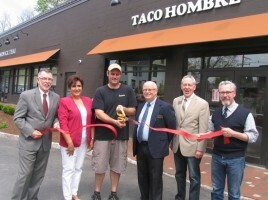 Taco Hombré… Great Mexican Food In Warwick, New York. Robert Kennedy and Chad Wieber spent some time living and surfing in San Diego, California back in the late 1990’s. They fell in love with the surf, the sand, the sun and the style of Southern California living. But perhaps more than anything else, they fell in love with the awesome, fresh, flavorful food stands and small cantinas that dot the landscape there. The “taqueria” – roughly translated as “taco shop” is a fast, fresh style of Mexican cuisine based on savory meats and fish prepared quickly and adorned with fresh veggies like chilies, tomatoes, onions, cilantro and avocado, all held together for easy consumption in a corn or flour tortilla. Kennedy and Wieber returned from Orange County, CA to their home in Orange County, NY intent on retaining their surf mentality and sharing the culinary tradition they’d experienced with their friends and community. Since 2010, they’ve operated Taco Hombré, a great little spot with food and decor reflecting real pride and attention to detail. Clearly, Orange County NY was ready for the concept as Taco Hombré has quickly become one of the “must visit” restaurants in the area. They may not have an ocean with waves to ride, but they do have the spirit of the Mexican Taqueria right in downtown Warwick!